Maybe you just bought a home in Rhode Island or Massachusetts. Maybe you’re building a home in New England. Maybe you’re planning on totally overhauling your home’s HVAC system. Whatever the case, you’re trying to decide between a gas boiler and an oil boiler. But you’re not an HVAC specialist; you don’t know the ins and outs of complicated heating options. That’s why we’re here. Let us help you find the perfect solution to keep you and your family nice and toasty this New England winter. First Things First…What Exactly Is a Boiler? Let’s start with the basics. You might have a vague idea of what a boiler is or how it works but let’s just make sure we’re all on the same page here. A boiler boils water, which turn it into steam. This steam is light, cheap, and safe and moves the heat wherever it needs to go. Steam is lighter than even air, so you don’t need a lot of energy to push it around. Once the steam brings the heat where it needs to go in your house, then the steam comes back to the boiler in the form of water. The boiler heats it up again to turn it back into steam and the process starts all over! Because the water is already warm, the boiler doesn’t have to do that much work to turn it back into steam, making the system pretty energy efficient. Ok, so now we have the SparkNotes version of how boilers work. Let’s get down to the nitty gritty about oil boilers versus gas boilers and which one is right for your Massachusetts or Rhode Island home. 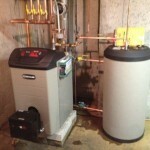 The main difference between oil boilers and gas boilers is storage. With an oil-based system, you need to have a tank to store the oil that is delivered to your house. Availability: Oil is popular in places where natural gas isn’t readily available. Maybe you don’t have gas in your neighborhood, or maybe your house isn’t connected to the gas line. With oil, that’s not an issue, because as long as there’s an oil provider near you, you can order, get delivered, and store oil for your boiler. Green-ish: You probably don’t exactly think “earth-friendly” when you think oil. But some progressive companies now sell oil that’s mixed with biodiesel, which burns cleaner than traditional oil. Biodiesel blends are also domestic, which reduces the need for and dependence upon foreign oil sources! Independence: Once you get your oil delivered to your storage tank, you don’t have to depend on anything else for your heating. You don’t need electricity or connection to a gas line. It’s a good choice for a back-up system because once you have the oil, you can heat your home. With gas, your house is connected to a gas line that probably also serves the rest of your neighborhood. Natural gas is pumped directly into your home when you need it, and is used as the fuel that your boiler uses to heat your house! It’s There When You Need It: Unlike oil, you don’t need to order gas ahead of time or worry about running out of your fuel supply. Gas is always there for you when you need it. Save the Moolah! : Oil and gas prices both fluctuate, but generally gas is cheaper than oil, so you should save some cash with gas! Go Green: Natural gas is undeniably much greener than oil. The Annual Fuel Utilization Efficiency (AFUE) rates natural gas boilers at an estimated efficiency of 90 percent! That’s super-efficient, which is great for the planet and your wallet. No Storage, No Problem: Unlike with oil, gas is piped in directly from the mainline to your house. So you don’t need to worry about storing your fuel on your property. No Biodiesel? No Good: If you don’t live near a provider that offers progressive, new Biodiesel blends to use in your oil boiler system, then you’re going to be no friend to Mother Earth. Storage Hassel: Unlike gas boilers, you need to store your fuel with oil. That means you have a finite amount of oil until your next delivery. And there’s always the possibility of having to deal with an oil leak or worse! Delivery Woes: If you’re the forgetful kind, then oil might not be for you. You’ll have to remember to order your oil regularly, and check to see how much you’ve been using every so often. And if you’re stuck in a big storm, your oil might not be able to get to you if you run out. Yikes. Connection is Key: The main thing about gas is that you have to be connected to a municipal gas supply. That’s the only way you can get gas in your home, and if your town or area doesn’t offer that then you simply can’t have a gas boiler. Maintenance: Because you need to connect to the mainline, installation can be expensive to install the piping. And it’s important to properly maintain and repair your gas system, more so than other systems. Carbon Complications: Though it’s rare and unlikely, especially if you properly maintain your gas system, carbon monoxide leaks can occur. This could cause carbon monoxide poisoning or even explosions and fires. The bottom line is, both systems have their advantages and their drawbacks. To figure out what system really is best for you, then contact Total Comfort HVAC at 401-533-3302, 774-284-3585 or email us at info@totalcomforthelp.com for a free consultation to find the perfect heating system for you.